“Welcome to San Juan Island!” An enthusiastic group of summer mentors met the evening ferry early in June to gather a large group of undergraduates who would be spending their summer doing independent research with faculty mentors at Friday Harbor Laboratories. They were a diverse bunch that had travelled from around the USA and they were tired and hungry. We whisked them off to the Bowling Alley for pizza and salad, then took them to FHL and got them settled into the huts, where they would live and work together for the next nine weeks. So began the FHL BEACON/BLINKS/NSF REU Internship program that has been facilitating undergraduate research for the past three summers at FHL. The program was premiered two years ago through an NSF grant obtained by Dr. Adam Summers, FHL Associate Director to fund travel, salaries and room and board for a large group of undergraduate students to spend the summer at FHL. These funds were matched with the long running BLINKS program and more support comes from the NSF BEACON: Evolution in Action Program, a collaboration of Michigan State University, University of Washington, University of Idaho, University of Texas and University of North Carolina A&T. The BEACON/BLINKS/NSF REU program was directed in all three years by Dr. Sophie George, from Georgia Southern University, this year also assisted by graduate student Jaquan Horton, who works on fish biomechanics at FHL with Dr. Emily Carrington. Dr. George balances fun, team-building activities, with technical and ethical lessons for the students, and professional preparation exercises. The students find this kind of experience enlightening, allowing them to immerse themselves into new ways of thinking and understanding the world around them. The frequent and close interactions with mentors, other FHL scholars and researchers allows all students a broader vision than a single laboratory research experience can provide. 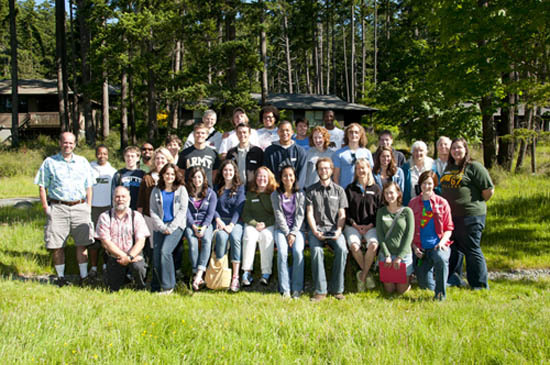 The primary goal of the BEACON/BLINKS/NSF REU program is to provide undergraduates with a research experience that will deepen their understanding of the importance and dynamics of independent research, introduce them to new approaches and tools for research, and give them exposure to graduate school as the first step on a scientific career path. Each student has a closely mentored independent undergraduate research experience, with a mentor either based at FHL or visiting FHL for the summer months. Students met with a different research scientist for a Monday lunch each week of the nine weeks to learn about the research and career trajectory of that scientist. These scientists varied widely in personal and professional interests each week and the students were free to ask questions as they wished. Then, each Thursday afternoon the students met together on campus to participate in professional development workshops, which included Training in Responsible Conduct in Research, basic statistics, and professional skills, such as putting together an awesome resume and how to apply to graduate schools and to NSF for funding. Students also participated in enrichment activities that had a research bent, including kayaking, whale watching, and a trip to the Seattle campus to meet members of the Oceanography Department and see what kinds of cool research is being done at the University of Washington. Nine weeks passed quickly and soon it was time for oral student research presentations to be prepared and final papers to be submitted at the end of the summer. For some, panic strikes, what if my data isn’t good enough, what happens if my larvae died? Such real fears of students are addressed by a gentle reminder from Jaquan, Sophie and their mentors about the importance of learning the research process, not everyone emerges from the summer with publishable work. That is the nature of good research. Like all research, the projects generate new questions, and this is where the students all shine. What will I do next? If I came back next summer, what would I do differently? What is the most significant finding of the summer? Everyone worked together to present a polished research talk and final paper for the FHL Library. Mentors and students critiqued each other’s work and offered helpful suggestions about how to present difficult concepts to a general audience. Final talks are an emotional time. Students work to keep their talk to a nail-biting twelve minutes to leave a few minutes for questions. The Commons had a full audience, in spite of the rare sunny day outside. Everyone was interested in what these students had been doing all summer long. This year, the final talk spanned two days, with eighteen students presenting their final data. Afterwards, there was cheering and many more scientific discussions, facilitated by the excellent talks. A list of the varied research topics and students that participated is below. Before we knew it, we were loading the students back on the ferry to return to their home institutions, with a group of life-long friends, mentors invested in their success, and a love for San Juan Island and Friday Harbor Laboratories. It is our hope that these students return to do research here again and again, and become the mentors of the next generation of undergraduate students in the program.